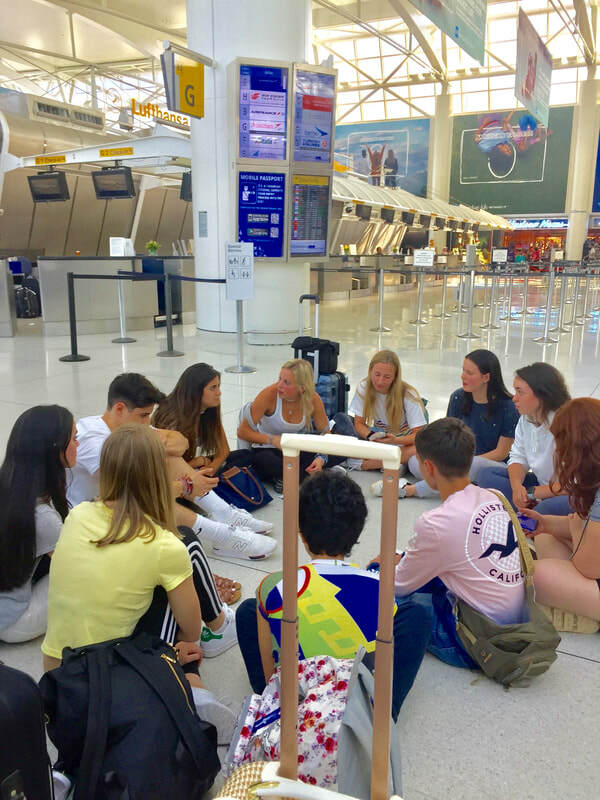 So here I am for my last blog post... sorry to say I will not be journeying on to Rome with the group, I am headed back to JFK with those students that are heading there as well.... maybe I can convince Julia and Jacopo to throw some blog pages up while in Rome! If not, well then you will hear from your kids first hand how amazing Rome is. We had a fabulous 2 full days here in Venice. We arrived late Friday. Saturday half went to the beach here on Lido Island, and toured around, and half headed to Venice with other staff to see the Accademia, a Modern Art Museum and other fabulous sights! I was the lucky one to relax in Lido with some of the kids. The beach was FABULOUS. The water felt so great on my tired feet! 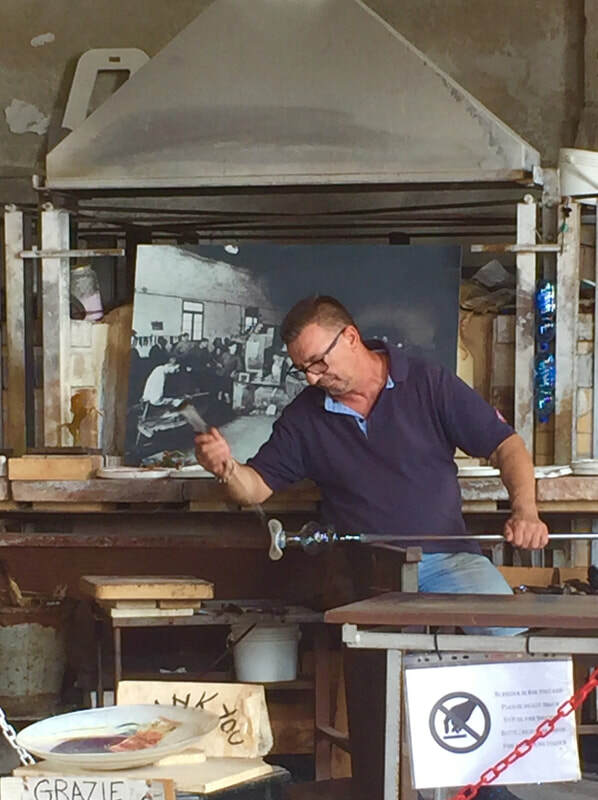 Today, Sunday, our day began with a ferry ride over to Murano, an island here in Venice that is known for the beautiful artistry of blown glass. The stores were chalk full or gorgeous things to see and buy! we were able to attend a demonstration which showed us how it's done. The kids were quite impressed and a very captive audience. 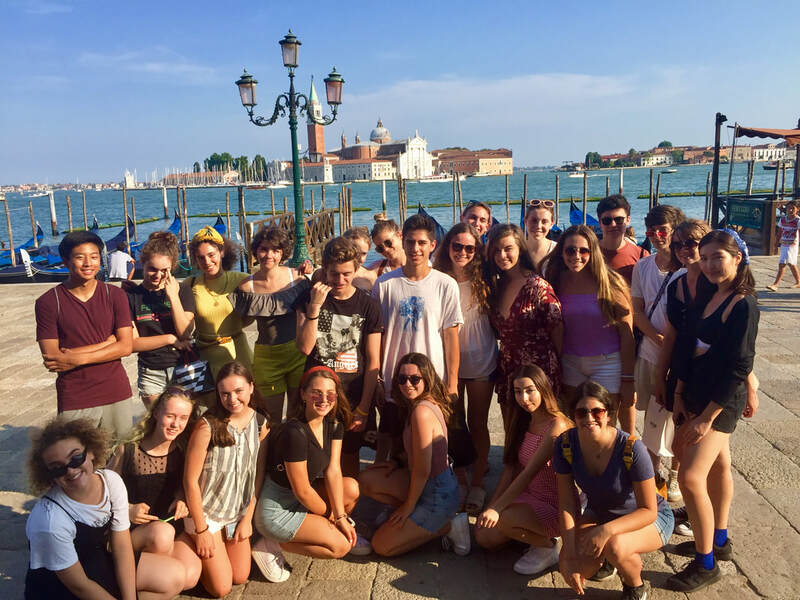 Jacopo took the some students to see Doge Palace while others took the opportunity to explore on their own and do some shopping. It was very hot and those ocean breezes were really appreciated. 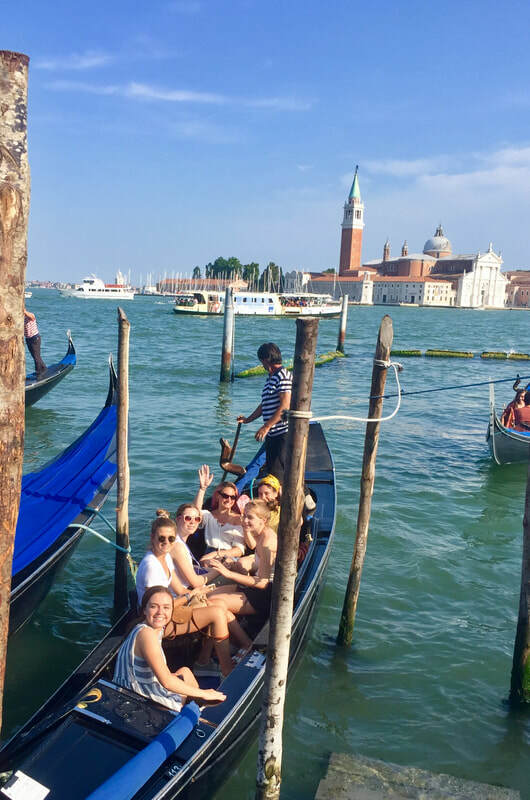 Our afternoon was complete with Gondola rides! the kids looked so cute sailing away. 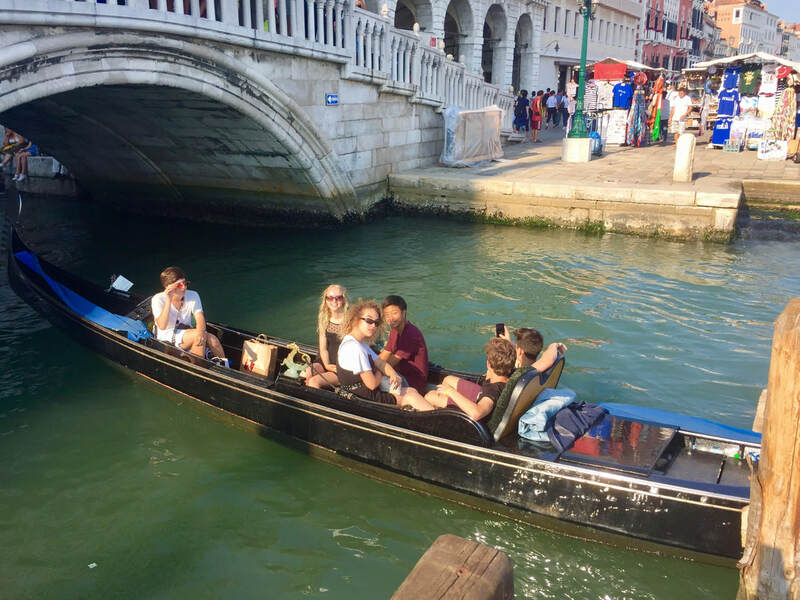 I tried to get some pics but those Gondolas went faster than I expected! 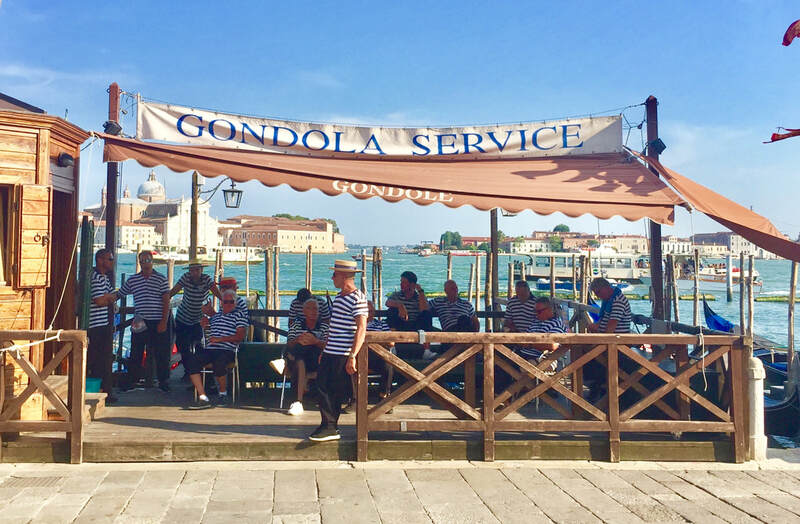 ​Slow day to be a Gondolier??? 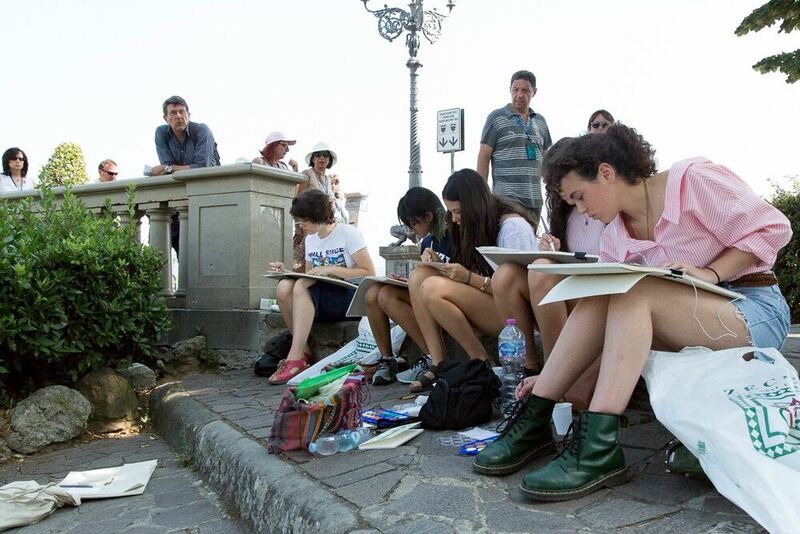 Art Class, Cinque Terre, Verona! 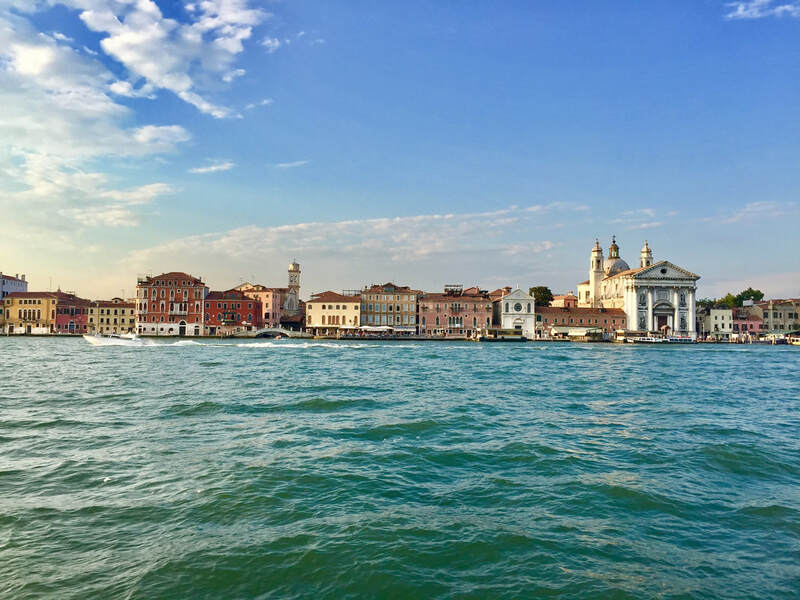 I am writing you from Venice! I’m currently sitting in the lobby with a huge window behind me where there is a nice breeze blowing in. We are on the island of Lido, which to my surprise has palm trees! I didn’t know there would be palm trees in Venice. 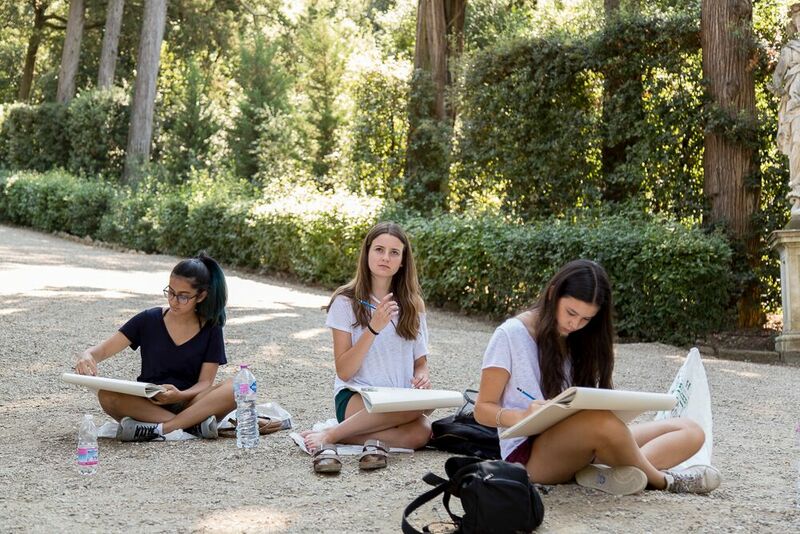 I will share more pictures of Venice later, but for now, here are a few snapshots of our water color studio art class. 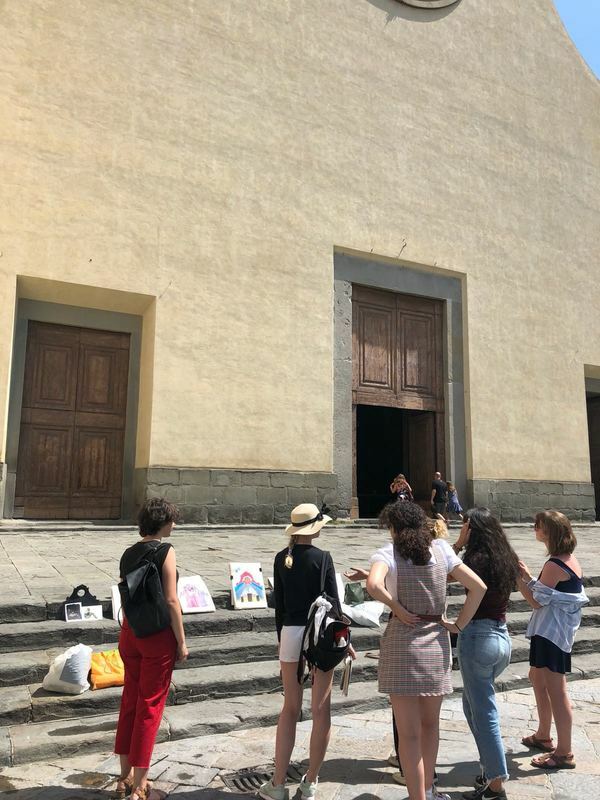 Travelling across the bridge to Piazza Santo Spirito, the visual arts class is examining and critiquing pieces of art sprawled out on the church steps. 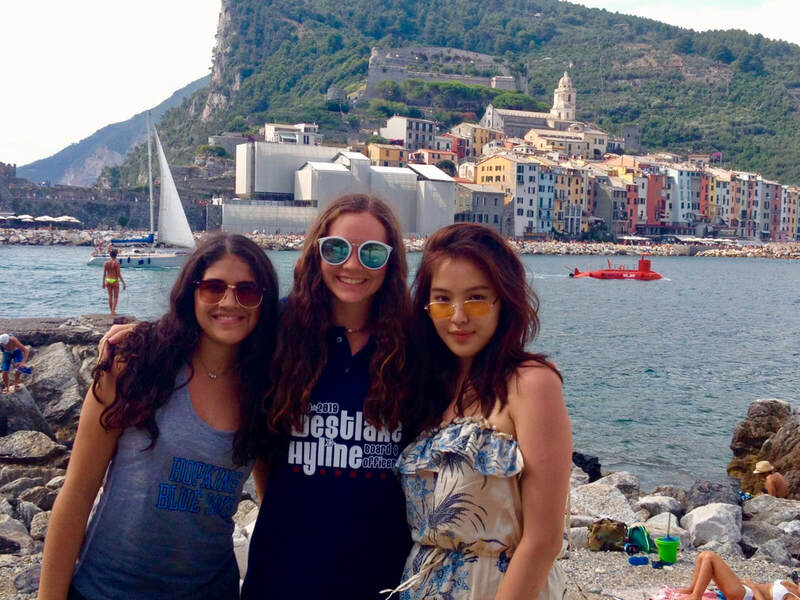 The group traveled to Cinque Terre and had a wonderful time! 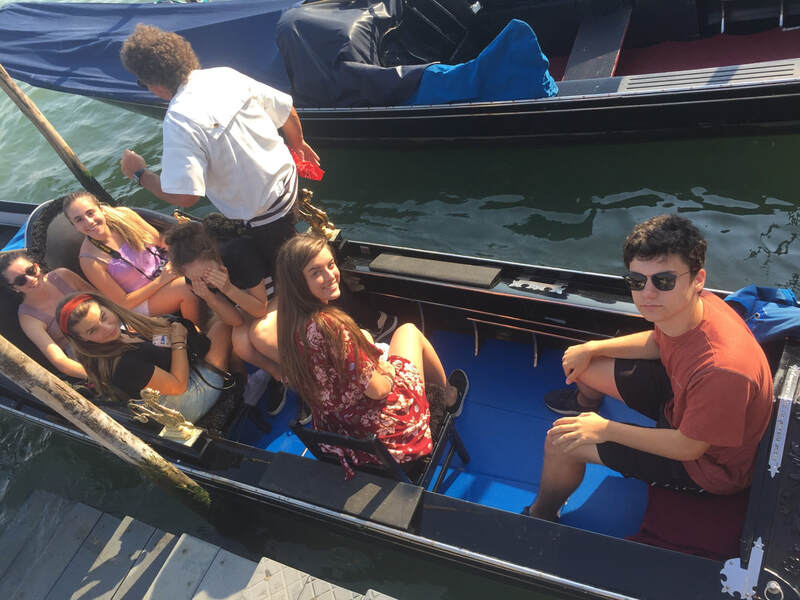 We took a bus to Spezia, and then a boat out to the Island. Although the beaches are a little rocky, the kids still had fun swimming and cooling off. 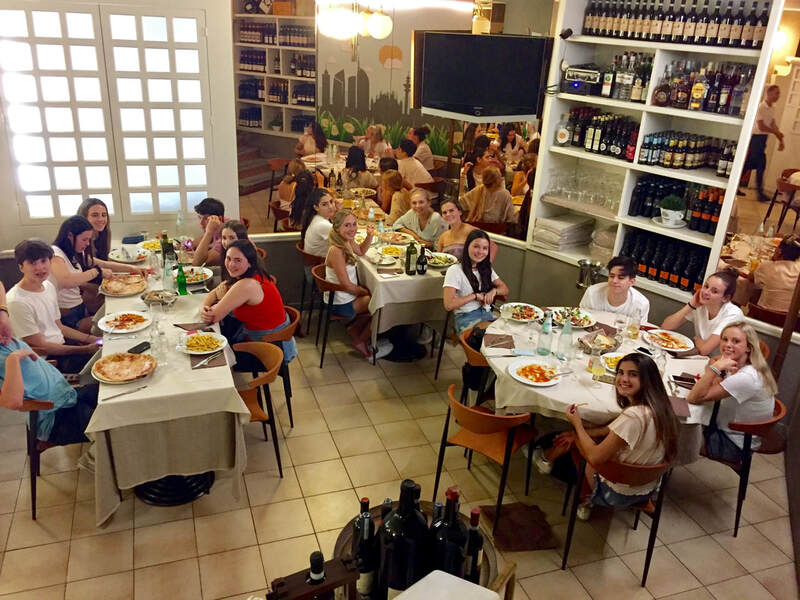 We were back in Firenze around 8pm and had our last evening with the students on the 3 week program. 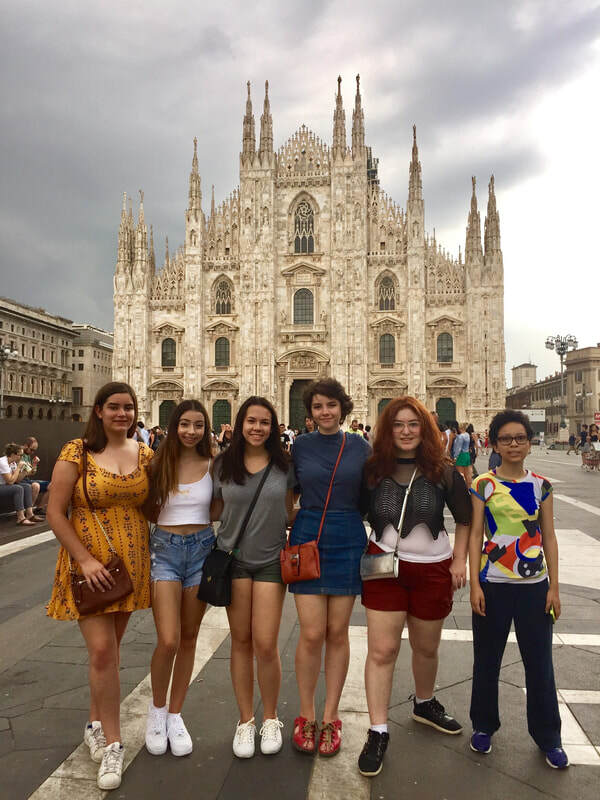 Its hard to say goodbye to friends that you meet from around the U.S.
On our journey to Venice, we made a stop in Verona for lunch and a break. 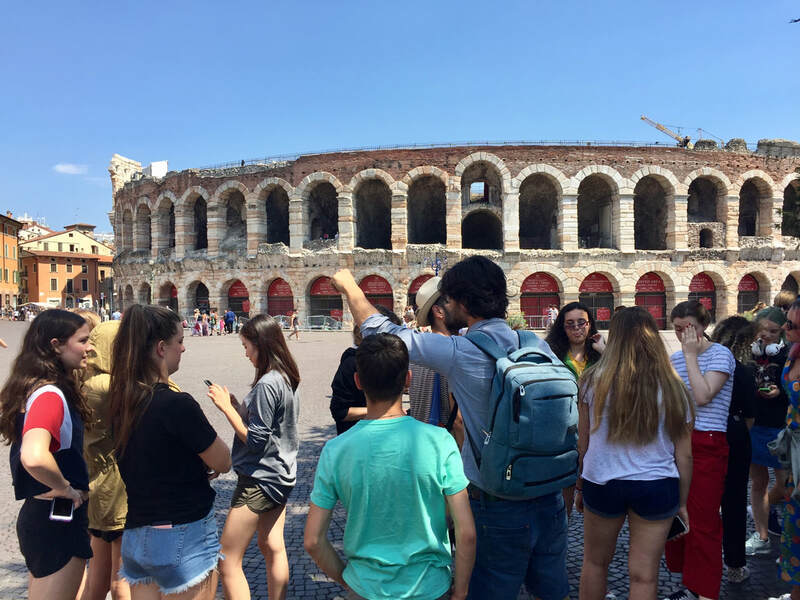 Of course Verona being the “home” of Romeo and Juliet, there were lots of sights to see having to do with the Shakespeare Romance. 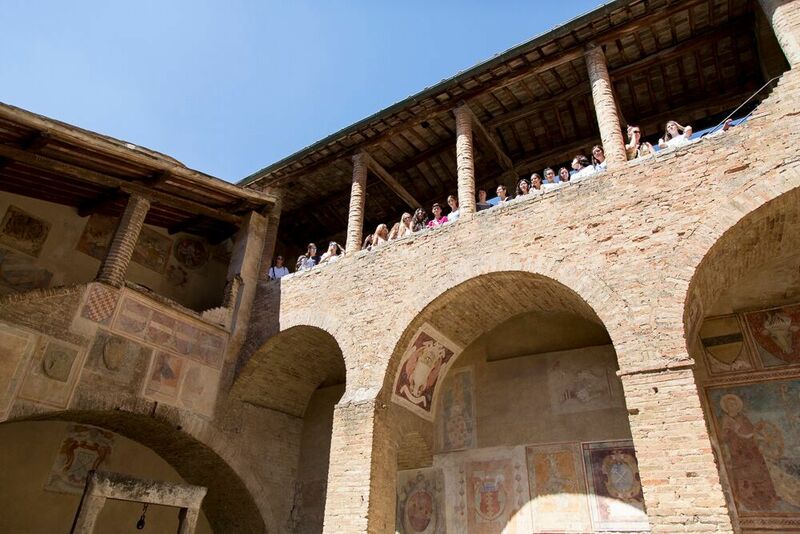 ​We visited the famed statue of Juliet. Touching her breast is said to bring one good luck in love! ​Below, I am all sweaty but posing for you in front of the wall to Juliets home, where people leave love letters! 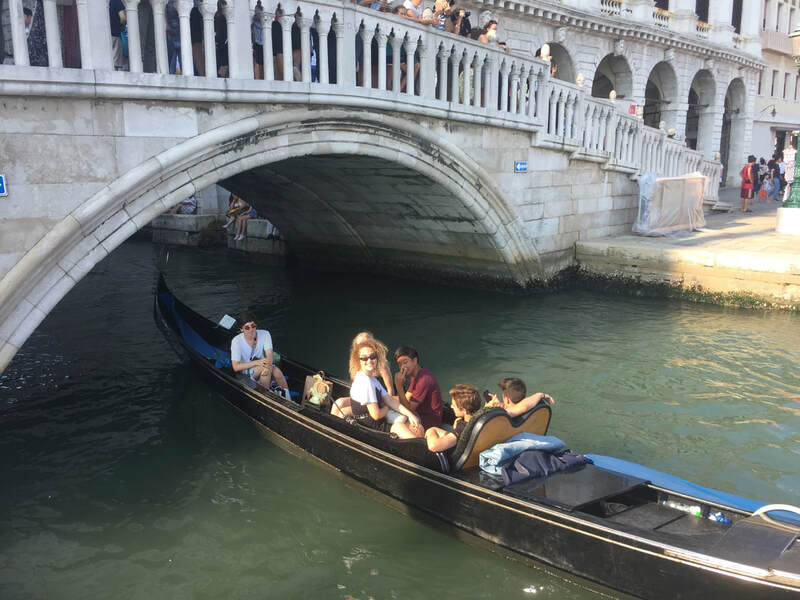 We arrived in Venice! Below is a sneak peak. 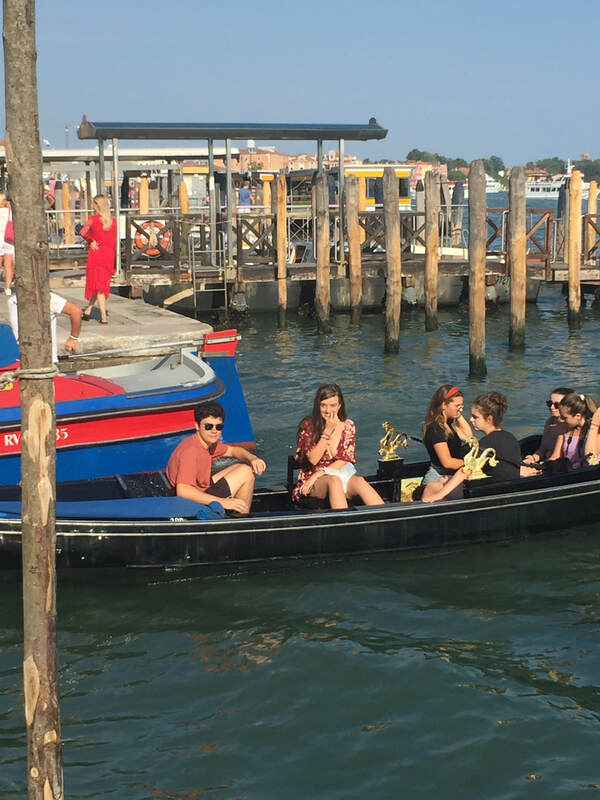 ​A student took the picture with the yellow boat! How pretty. Ciao from Firenze! We have been busy! 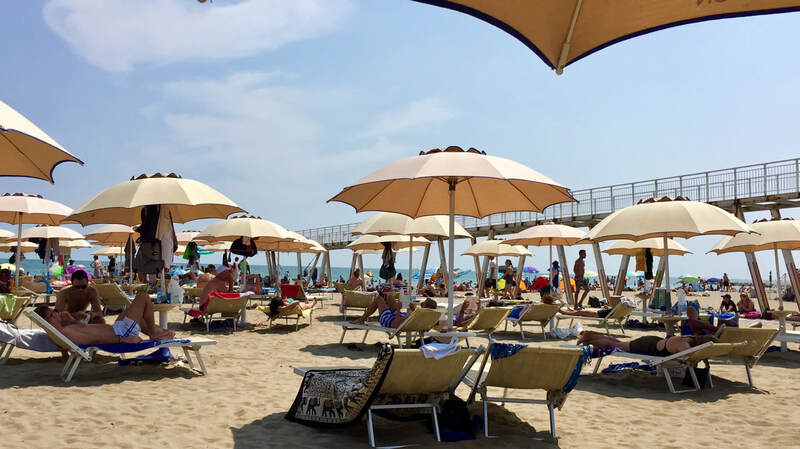 The group had a terrific outing to the beach in Viareggio, complete with swimming and sunbathing. It was a much needed break from city life. On the way back, we stopped in Pisa. The tower is still leaning, and kids are still making funny poses with it. Ours were no exception. 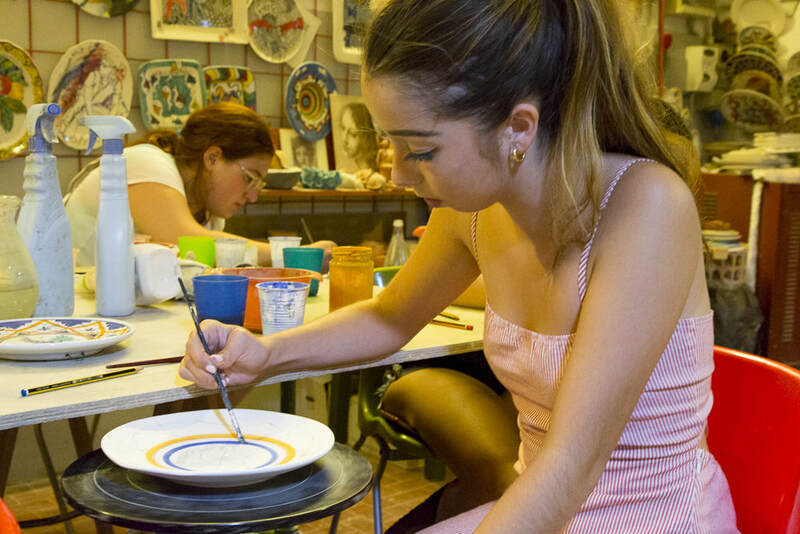 The students are so lucky that our staff member Marco knows of a local ceramics studio where he is able to bring small groups for a complete lesson, where they create and paint their own plate. After firing, I went back to get them and I was so impressed! what a great souvenir to take home. 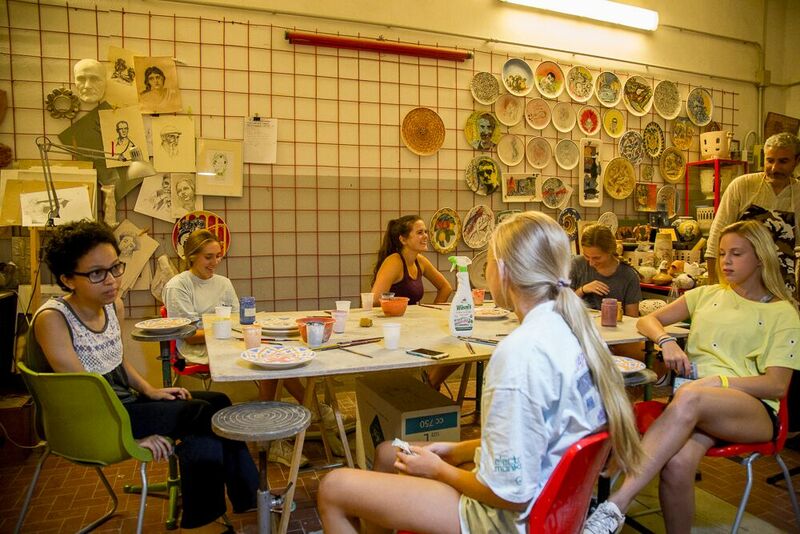 ​All smiles at Ceramics Class!! So relaxing to focus on their artwork. Another class that is in full swing and soon to be releasing the "film" is our film class. Students have created, acted, and filmed right here in our neighborhoods and apartments. 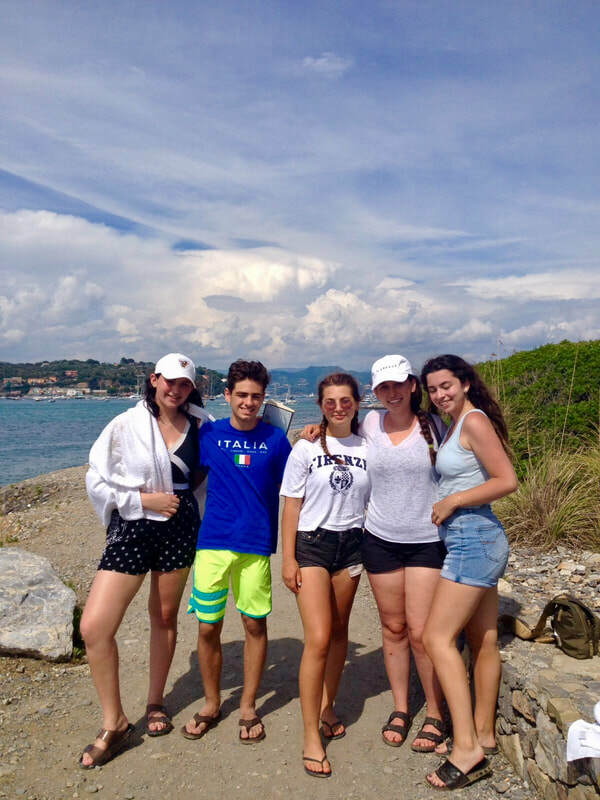 They have had so much fun working with our film teacher Tiberio. 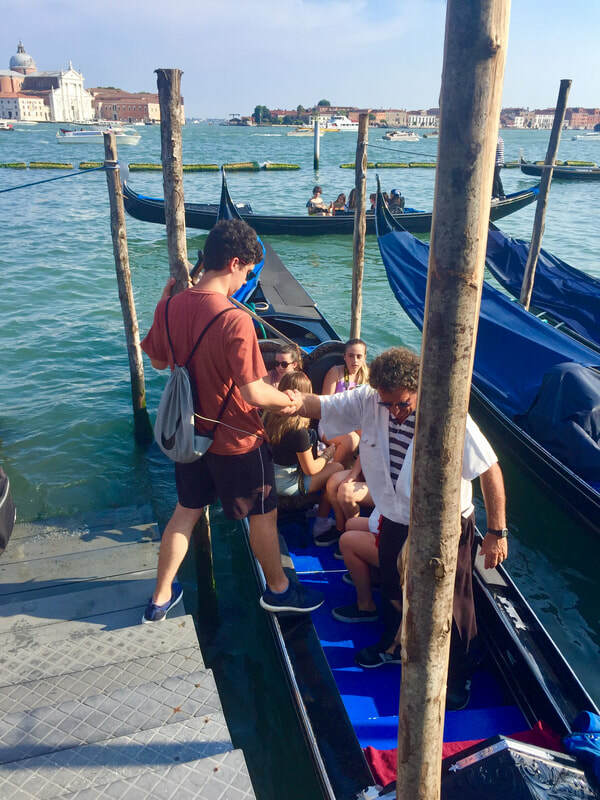 First Tiberio provides guidance and instruction, then the student is left to be the camera man. 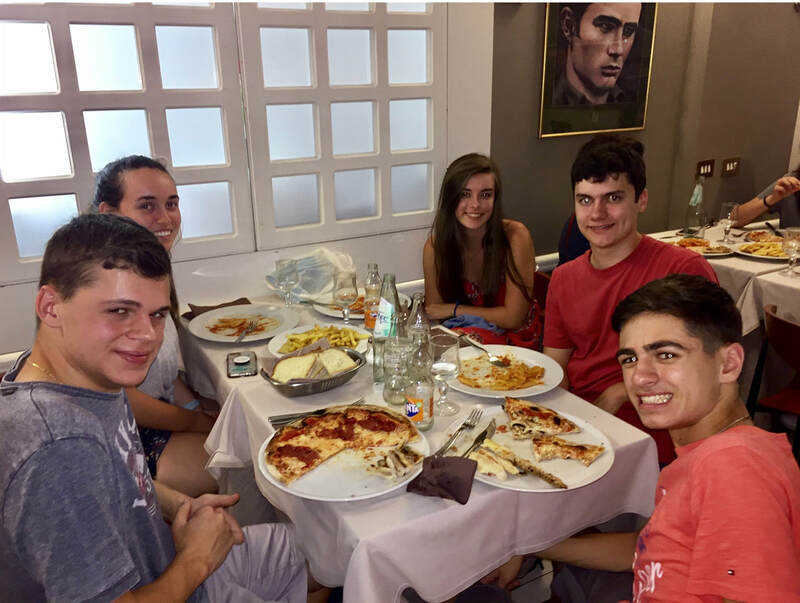 The Tuscan Cuisine class is always having fun! 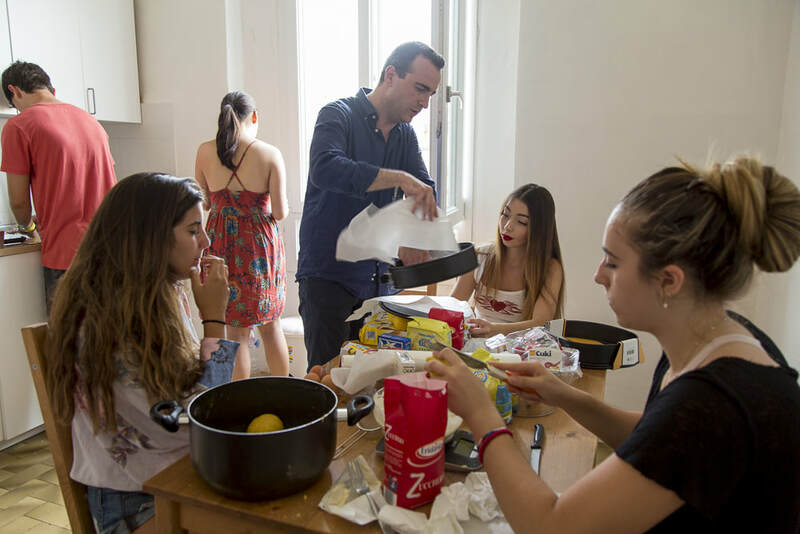 this class they were making a cake, baked in a dish called a tortiera. It looks SO authentic. Lets see if they can recreate this at home for you! put them to the test I say. 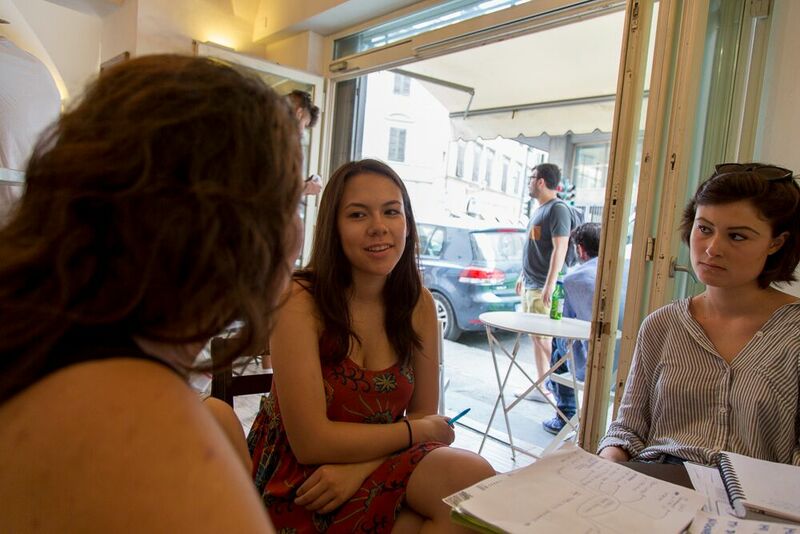 Of course we would not be without our Italian Language class, taught by none other than a wonderful local Italian teacher named Caris. She loves working with our students from the Abbey Road Program. 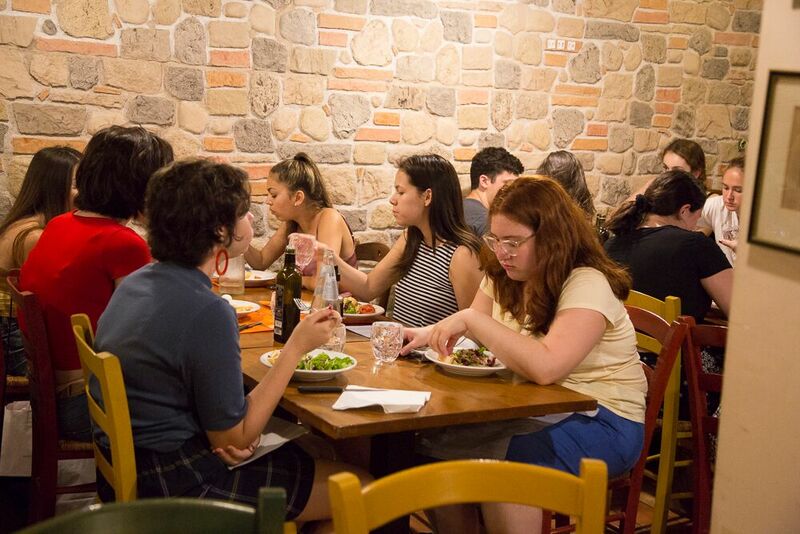 Sometime she takes the class to the cafe, so they can order, pay, etc in Italian. 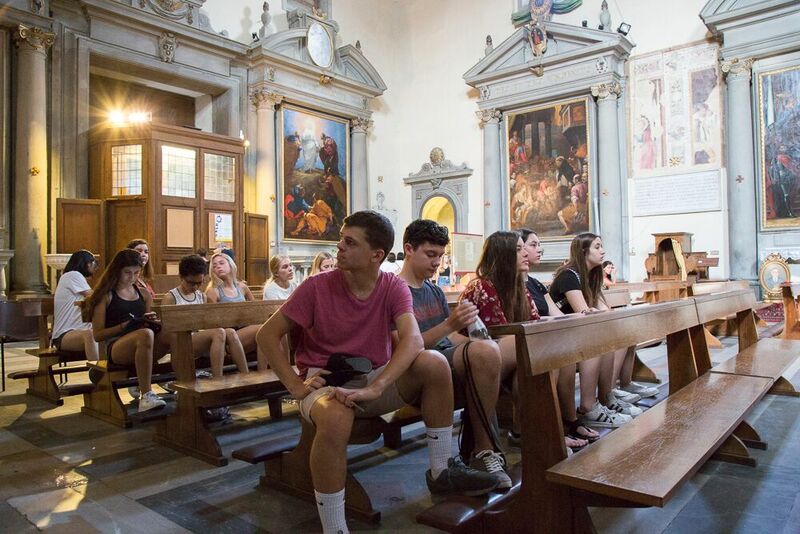 After our first two weeks here, the second group of students arrived here in Florence. It's been so great having new friends, new classmates and seeing all of the "firsts" through their eyes. Here are just a couple airport shots of tired travelers that managed a smile for me! Well I have more to share, but it's getting late here in Italy so I will sign off for tonight and share more in a couple days! check back! Posso Pagare con Carta? Can I pay with a credit card? Buon Giorno! Where did I leave off? have you missed my blog posts? 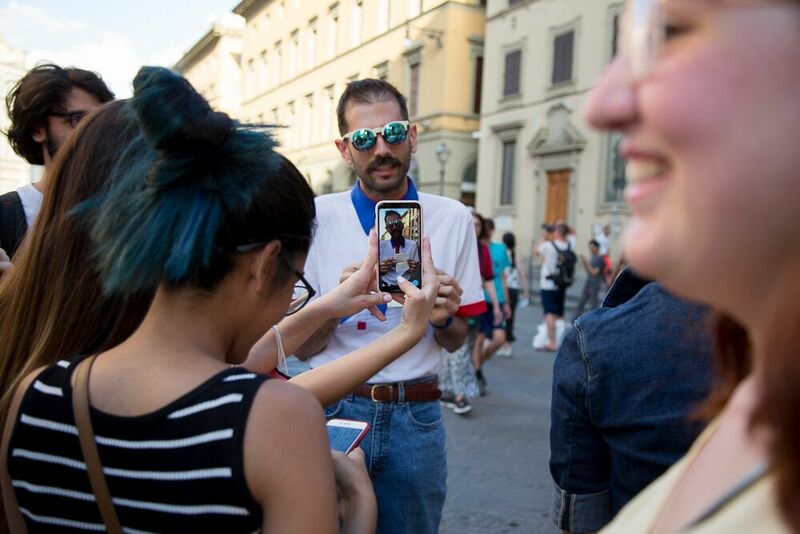 haha... just kidding, but here in Florence we have been so busy having fun and learning that I got swept up in the action and have missed a few days. Well I'm back. 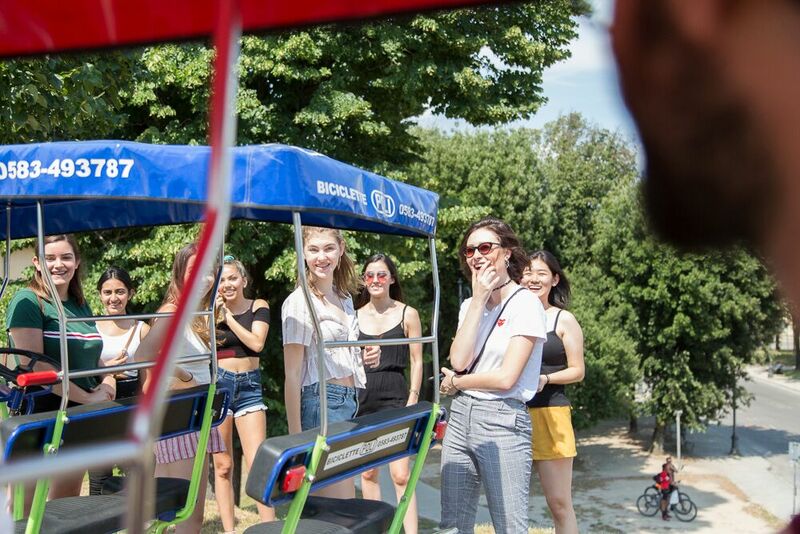 We took the students for a relaxing day at a public park that had a pool! You should have seen us Americans with bathing caps on! It was really nice to see them relax and unwind. 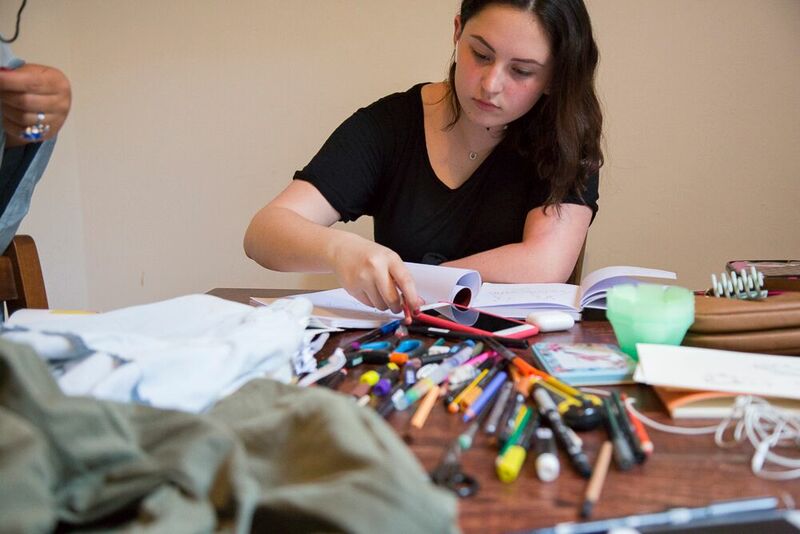 Classes are in full swing and the kids are really enjoying them! We have the best teachers, so knowledgable in their content area, and so interested in sharing this with our students. 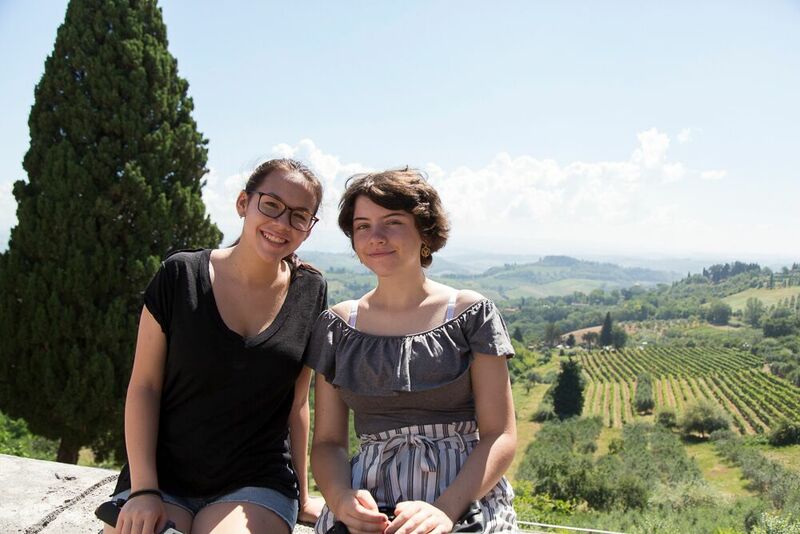 Here below are some digital photography students loving the process of learning, and what better landscape then Italia! 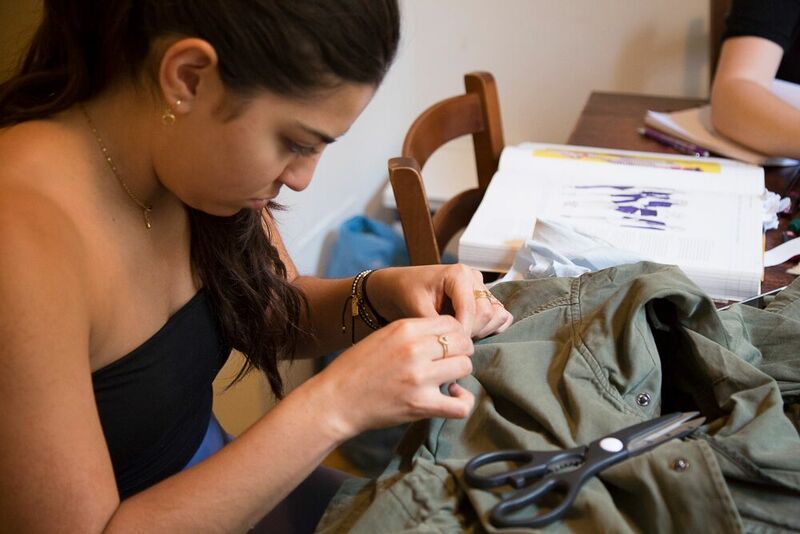 Fashion Design class has the pleasure of learning from local teacher Bianca. They are not only designing but also creating! Brava! 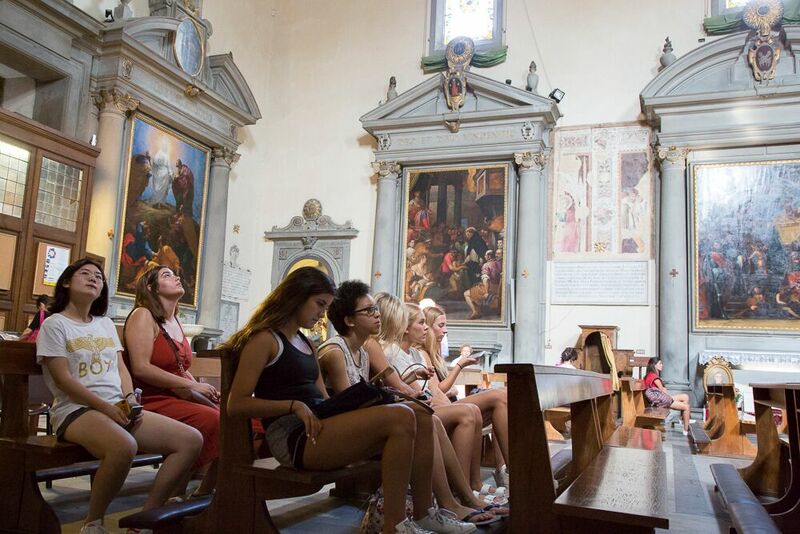 The Art History class taught by Jacopo, is a favorite. 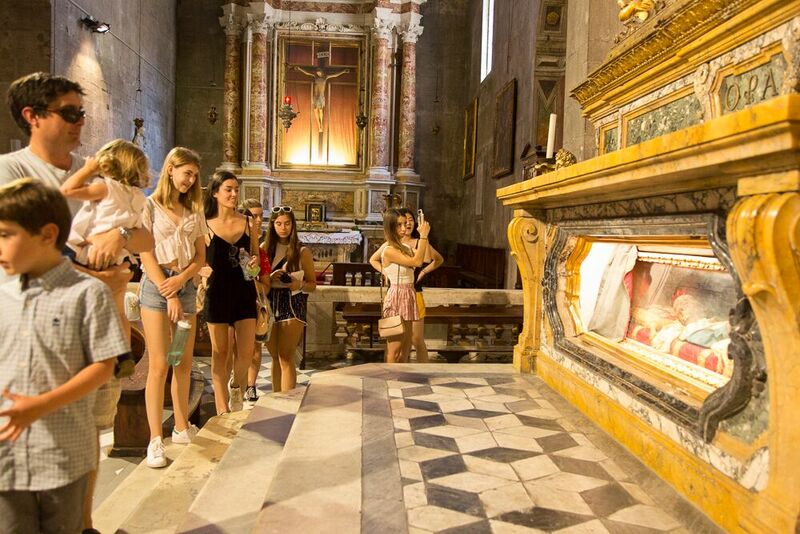 He is showing them fabulous churches, museums and teaching them all that he can in our short time together. He always has a captive audience! 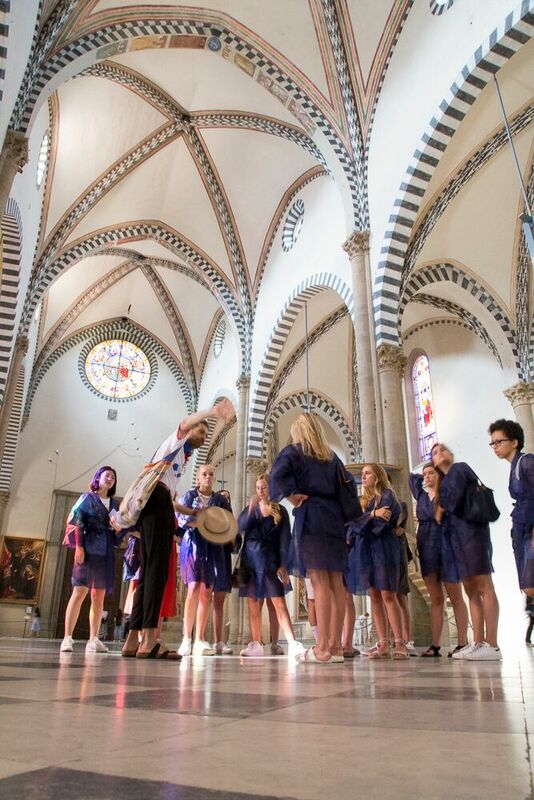 Above, they are visiting Santa Maria Novella and were giving "smocks" to cover up, since bare shoulders are frowned upon in churches in Italy. 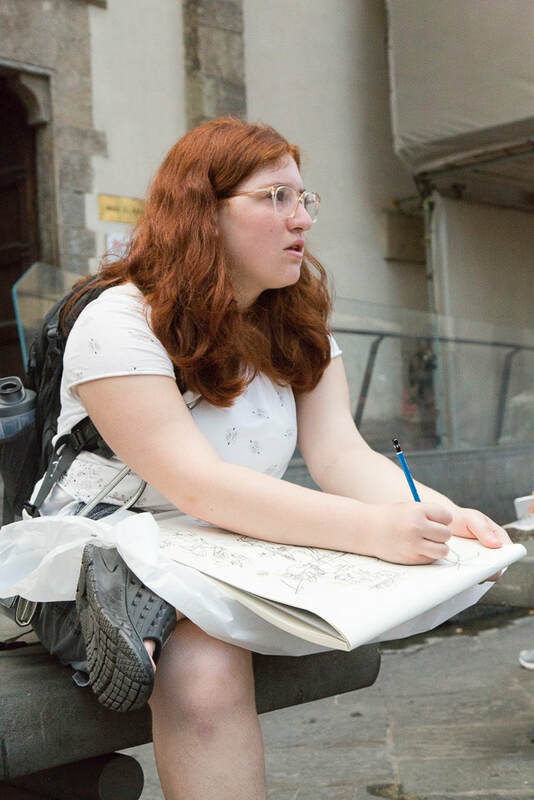 Of course the Art Class has no shortage of beauty to draw. 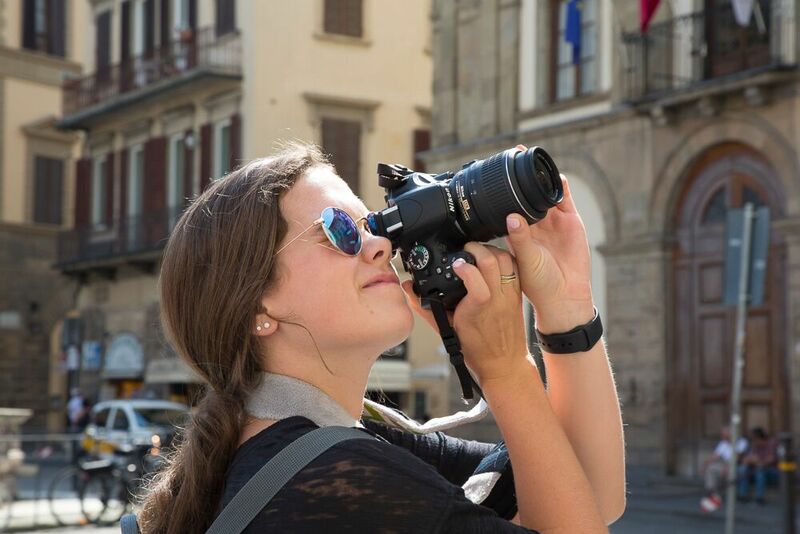 The instructor Lindsay has them traveling around Florence capturing as much as they can. Sometimes even in beautiful green space. 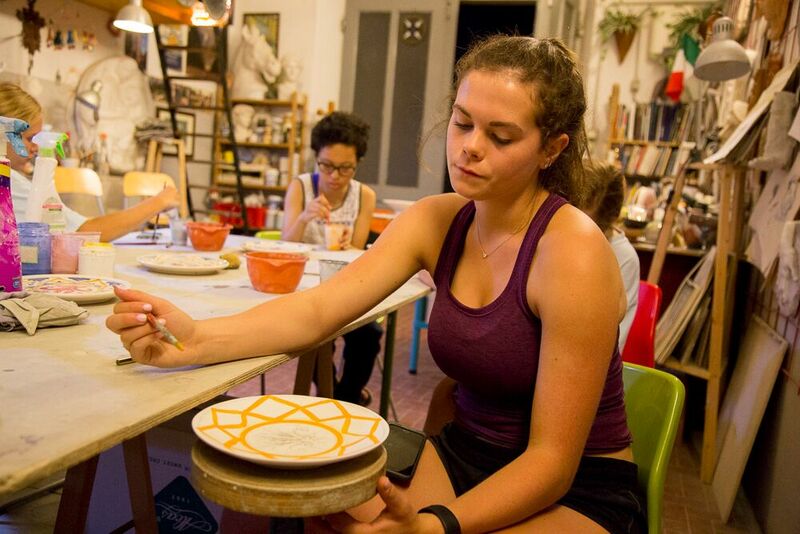 The students had a fabulous opportunity, which will be happening again, to take a ceramics class with a local ceramics teacher. Their dishes were beautiful that they made and everyone LOVED the class. Lastly, we are completely enjoying the food!!! Sometimes we have a catered dinner at a local restaurant and the cooks offer us something different each time. 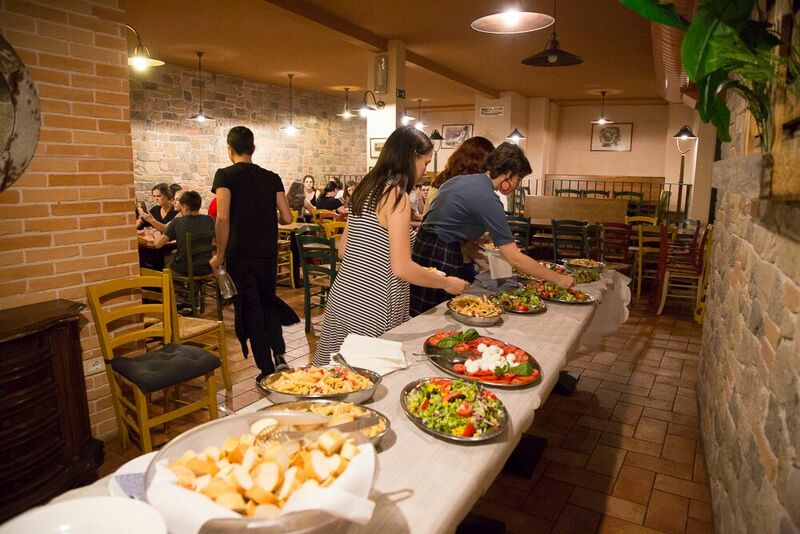 Since it's buffet, the students are always able to find something they like. This is the night I usually hear, "can we go now?" haha.. they are anxious to hit the town for a beautiful night walk around the Florence. Can't say I blame them. Dove la toiletta? Where is the bathroom? Abbey Road "hits the road"
This landscape looks like a greeting card... so spectacular. 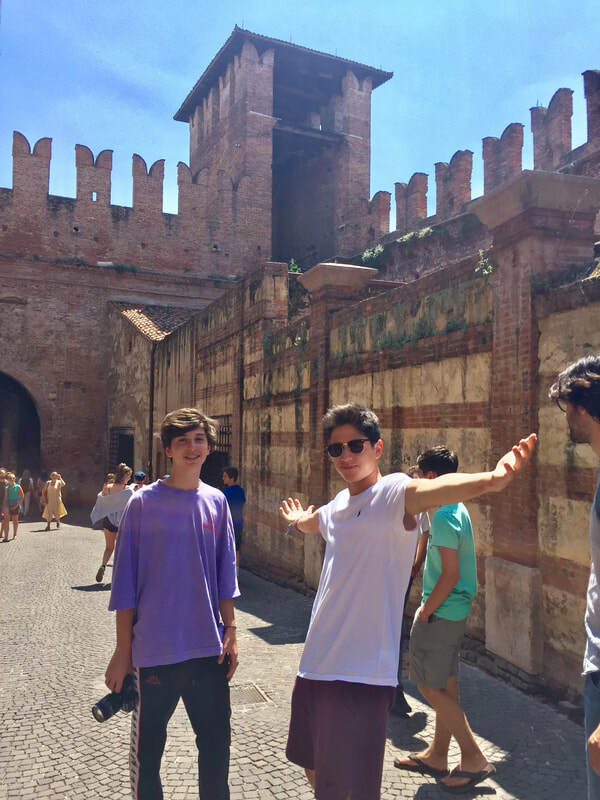 Then we headed off the the beautiful city of Sienna where Mother Nature was not too kind. The skies opened up and it poured. 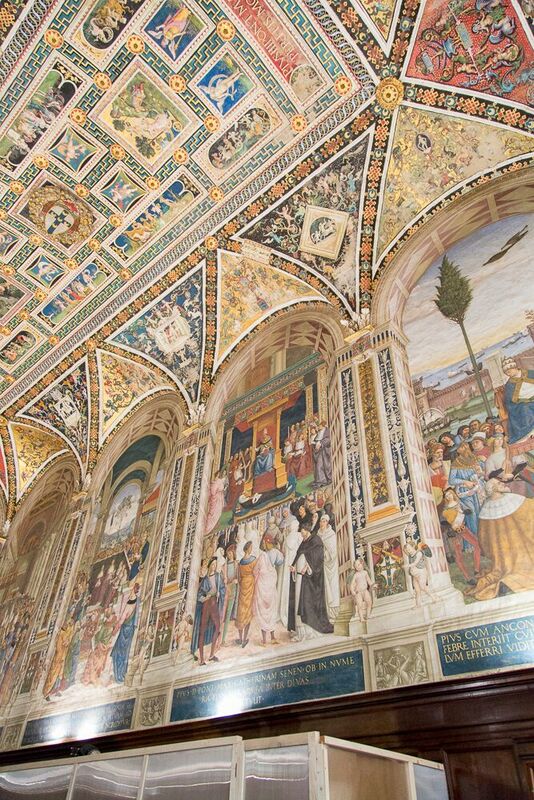 Here are a couple shots of the interior of the Duomo of Sienna. Our fabulous weekend of travel ended with a day trip to Lucca. We boarded the train here in Firenze and went to Lucca. 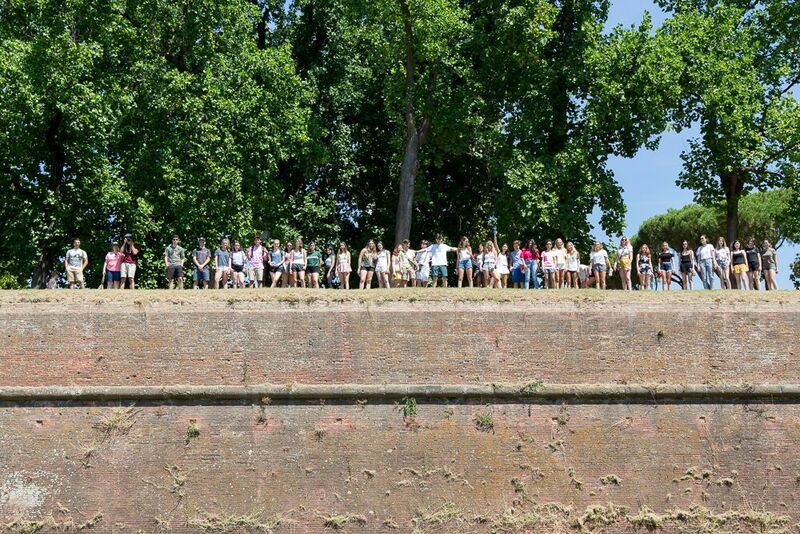 There we all climbed up to the top of the city wall where our photographer Marco got a fabulous shot! I was a little nervous I was going to lose someone over the edge. Happy to report, no casualties. We toured around Lucca a bit, had lunch in various cafes, pizzerias etc. and ended our visit with a bike tour. We all boarded bikes of different sizes and road around the perimeter of the city. Amazing! and so fun! lots of smiling faces and laughs. 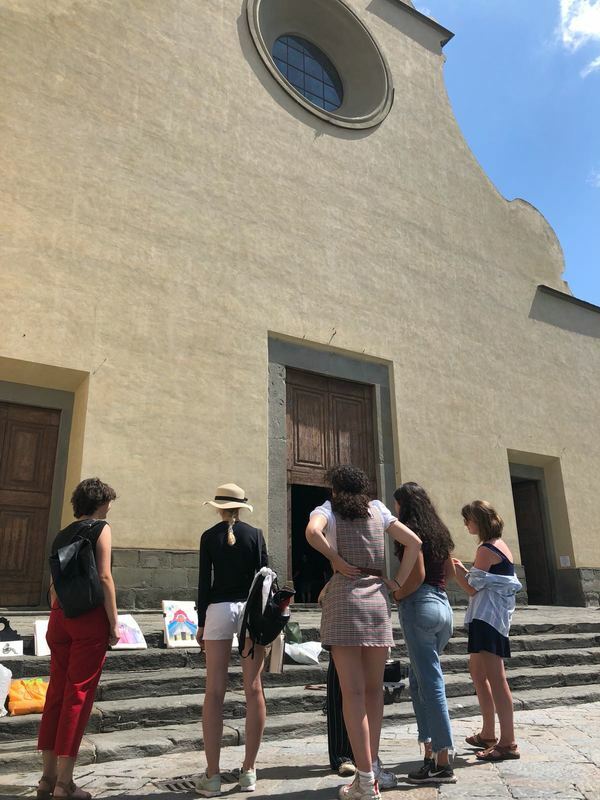 Classes Have Begun in Firenze! 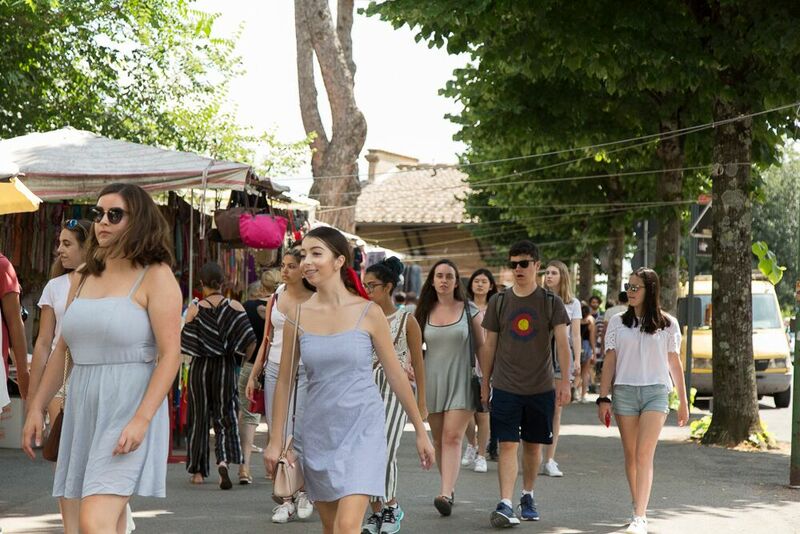 The days are becoming even more full as we swing into full gear with our enriching classes here at Abbey Road Florence. 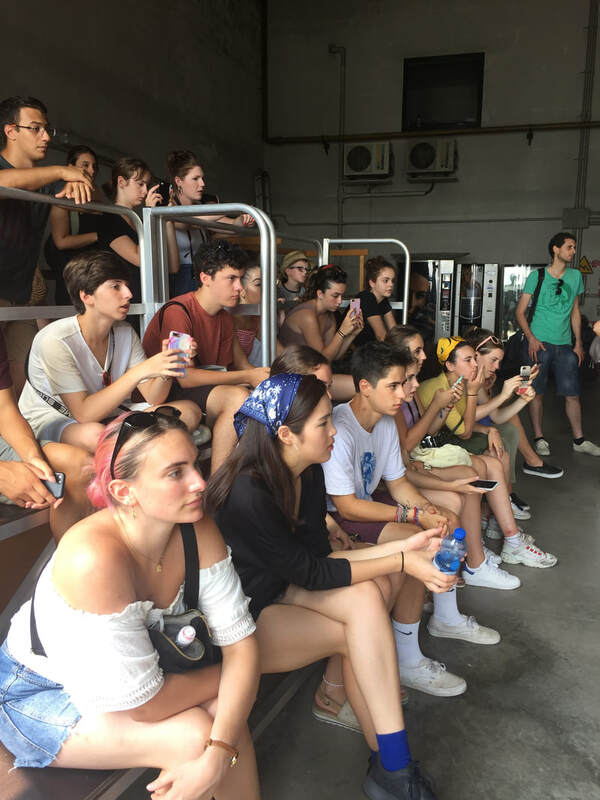 The students had an orientation to begin our time here. Exciting classes, trips to be taken as well as rules were reviewed. 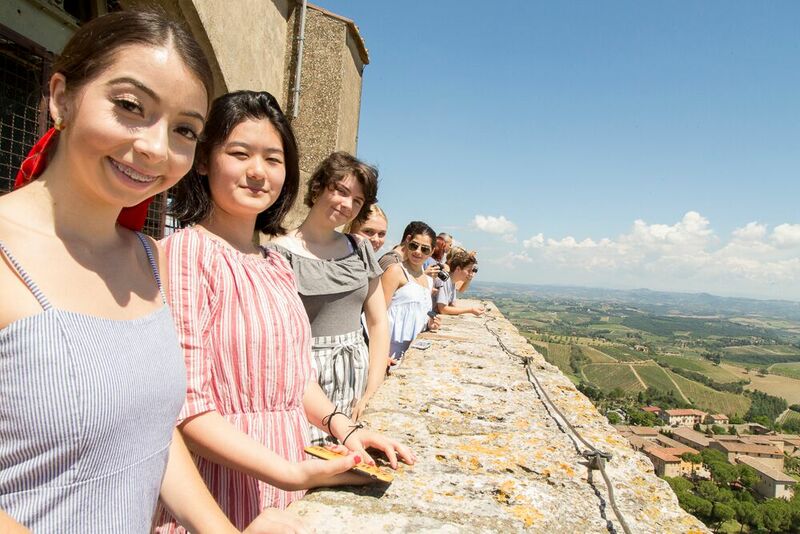 This is a wonderful, respectful group of students and I can tell they are here to learn, experience, taste, see, smell and enjoy all that Tuscany has to offer. What an attentive audience! 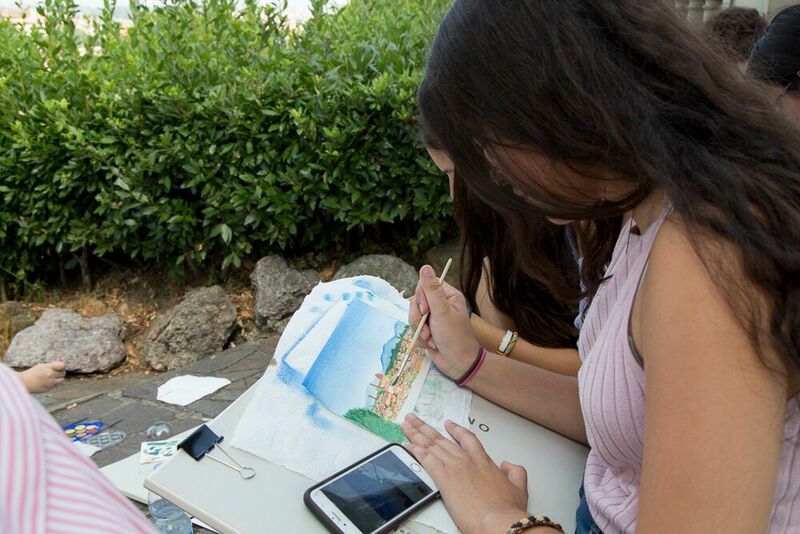 They will be enjoying classes such as Studio Art. 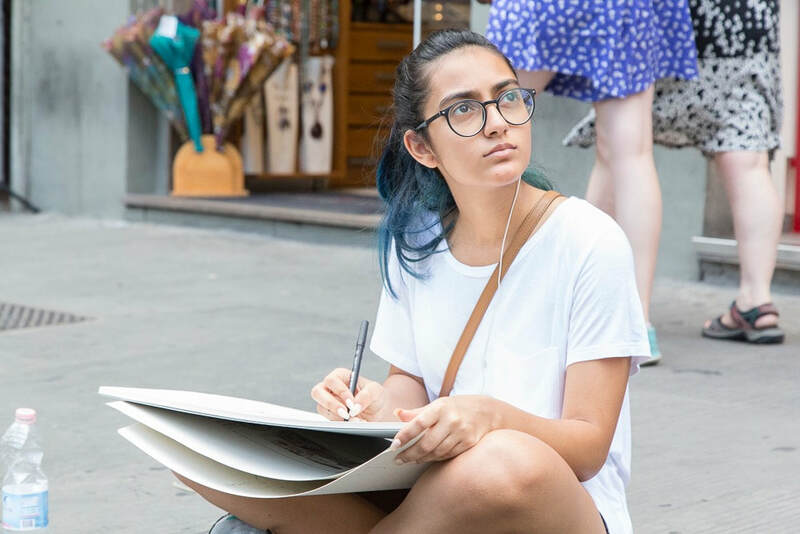 Could there be a more beautiful place to sit with a sketch pad? These students are completely in the zone! 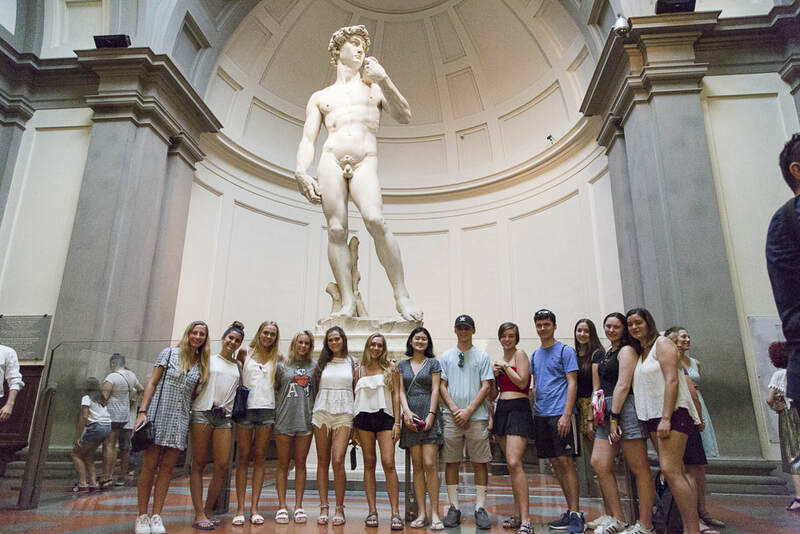 Their art teacher Lindsay even had her own art exhibition here in Florence and we all went! Below are students appreciating the art show. Outside of the Art Exhibition there was a lovely garden area with a curved staircase that just screamed, "take a group photo here!" 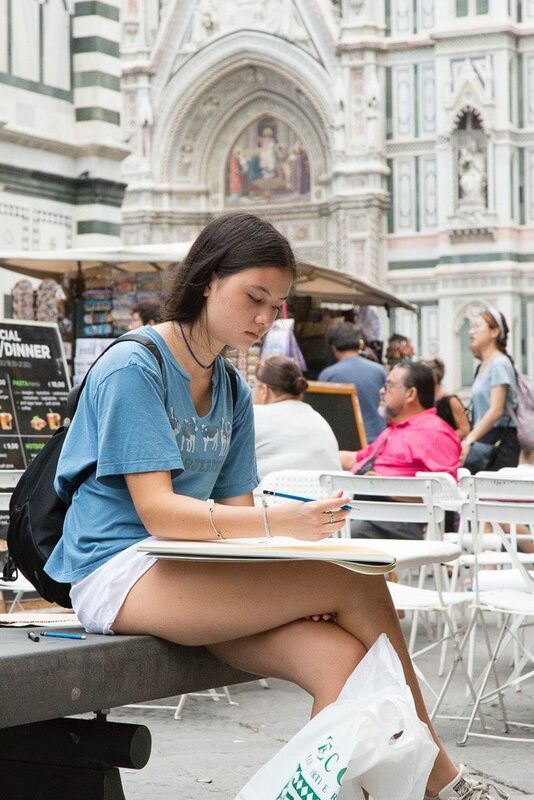 The looks on their faces are just so great as they concentrate on what the are drawing, as if there were not 500 people walking around them at the Duomo, they are completely focussed. Beautiful. 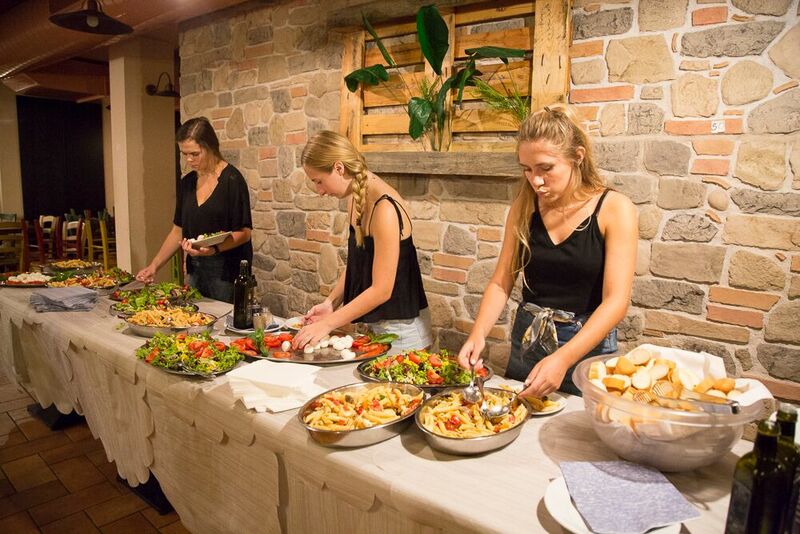 Another wonderful class for the students is Tuscan Cooking. 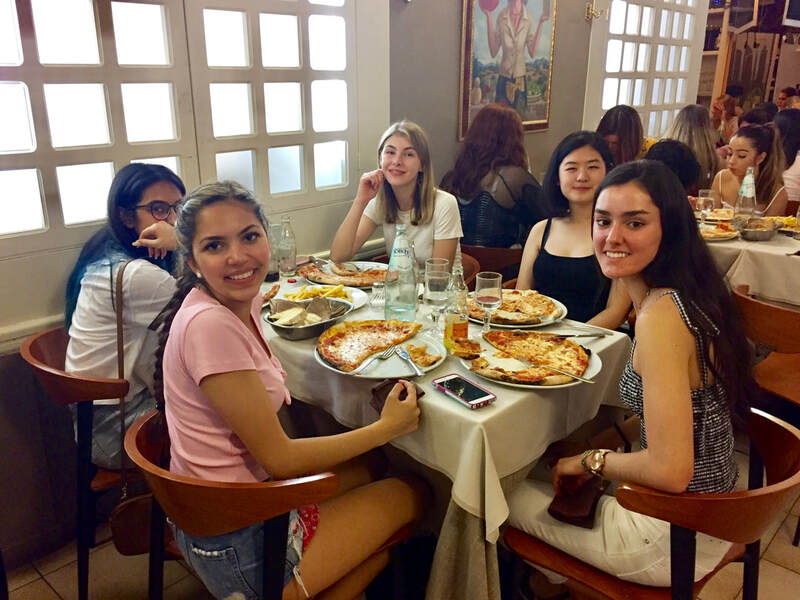 They are enjoying fabulous Tuscan cuisine in restaurants and now thanks to their teacher, Vieri, they are learning some of the tricks of the trade. I'm sure they enjoyed eating what they made! 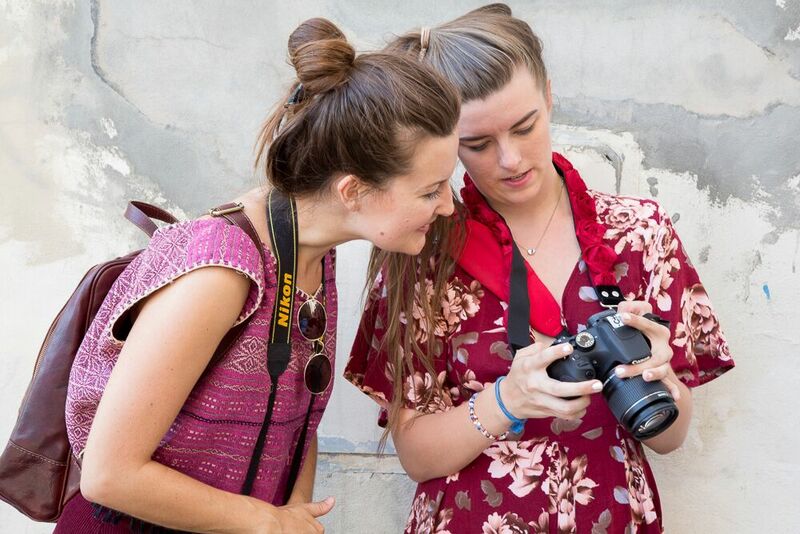 Next blog I will share some photos of Photography class, Italian Language Class, SAT Prep, Film and Fashion! So much to show you! But for now, Buona Notte, which means good night. Its bedtime here in Italy. We are going on another trip tomorrow so I'm hoping everyone here is asleep! Here's a few more photos for your enjoyment! Grocery Shopping for their apartment!!! Good Job Guys!! Who's that in the middle? I think someone wishes they were on the program and not the Director. Well, not true, I have some fun as well. Cuanto Costa? How much does it cost? We made it!! 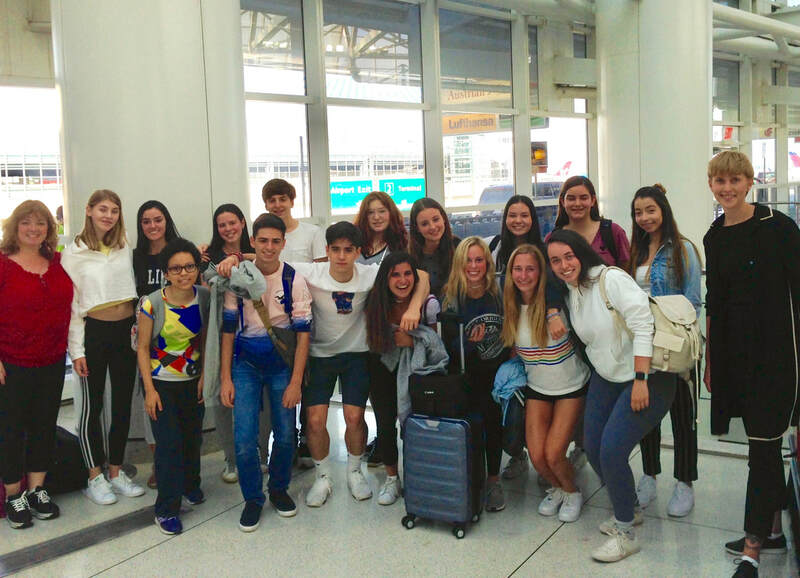 the long awaited journey to Italia was just that... long... but that is behind us and now it's time for fun :) I have just a few minutes to send you a quick blog because of limited wifi... part of being lucky enough to be in Italy... below are a couple shots of our students hanging at JFK... what a group! we found 15 more friends after we took this picture. We are now a group of 5 staff and 38 students! 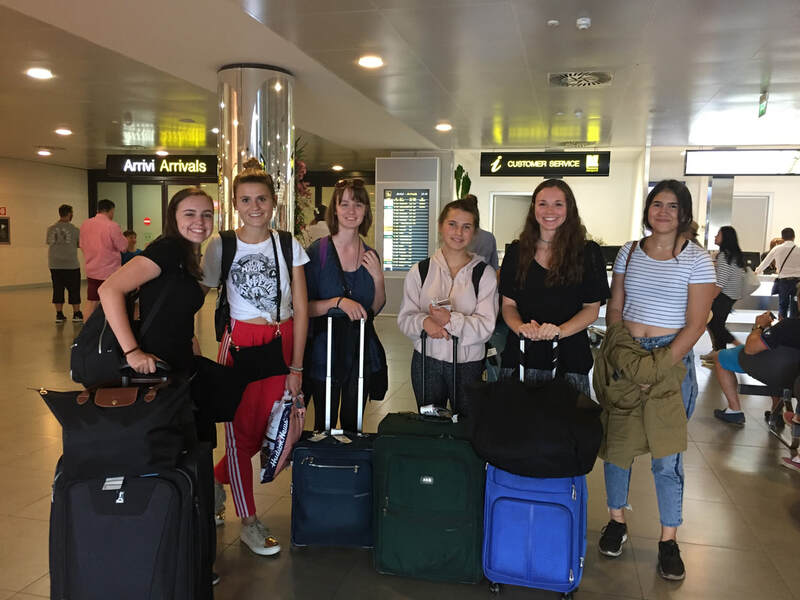 We arrived in Milan, sleepy and a little sweaty, but deep down under our sticky tshirts we were pumped to get on the big air conditioned bus and drive to our hotel, which was lovely, cool, clean and comfy! After a nice long rest and showers, we walked to the subway where we rode to the city center. Here was saw the famous and very beautiful Duomo. There were pigeons everywhere! No one got pooped on thankfully... although I'm told that's good luck! OK CIAO!!! that's all for tonight... Goodnight, Karen. Va Bene .... It's Good! OK! 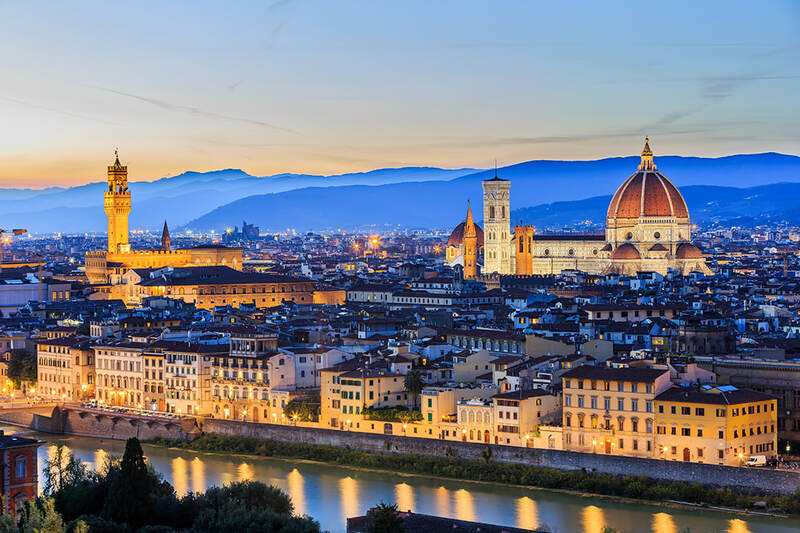 Who's Ready to Go to Florence? Me!! Good Evening Students and Parents! I'd like to introduce myself. I am Karen Spinale, your Program Director for the Abbey Road Florence Program. 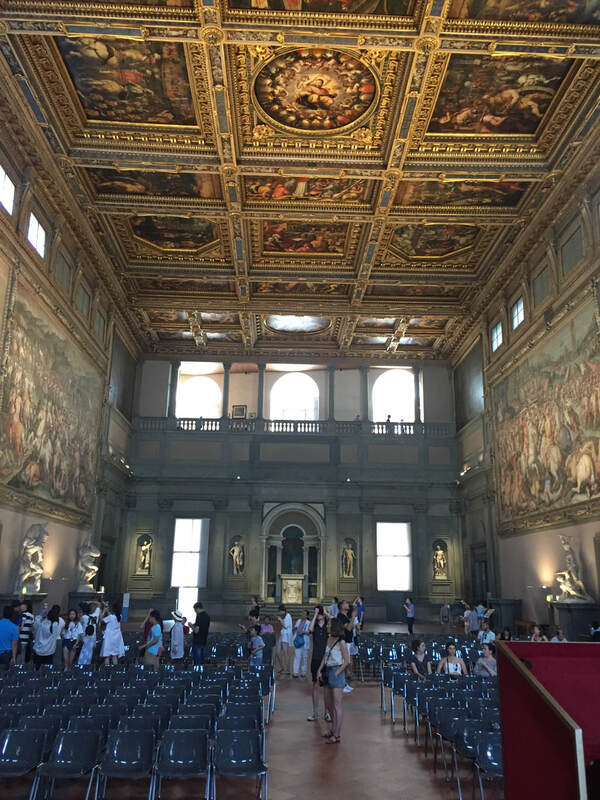 Trust me, I am just as excited as all of you are, since I have been to Florence, and I just love it. 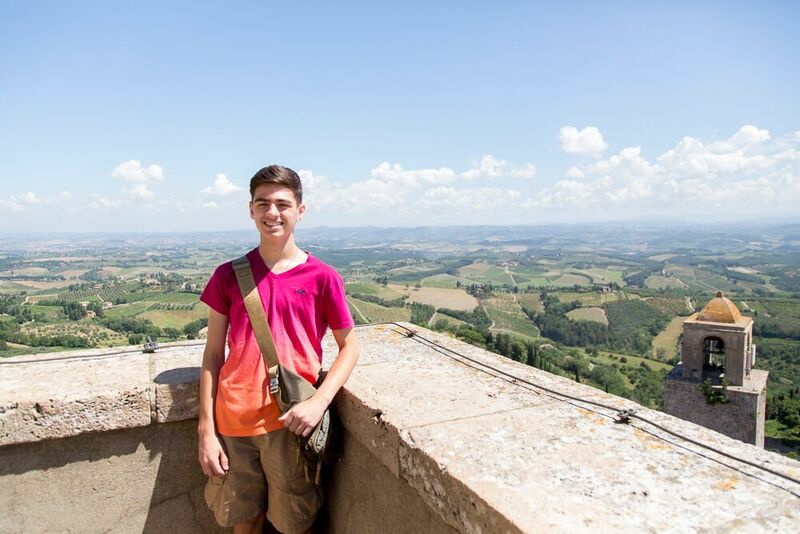 Below is a recent picture of me, in Urbino Italy, where I did MY study abroad over 30 years ago. It was wonderful to go back and visit. 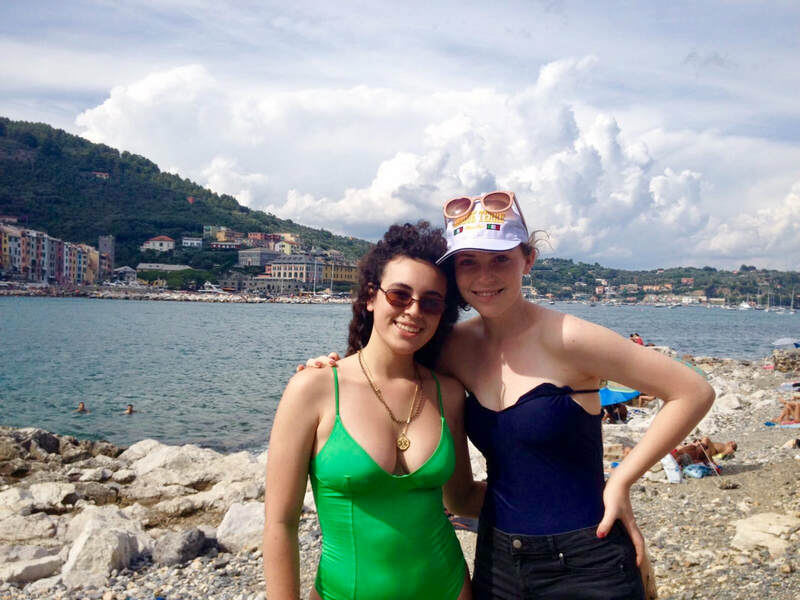 So just think, one day you may be going BACK to Florence to reminisce about the wonderful summer YOU had in 2018. Families back home, I will be doing a blog post every other day to show you all the wonderful moments your children are having. 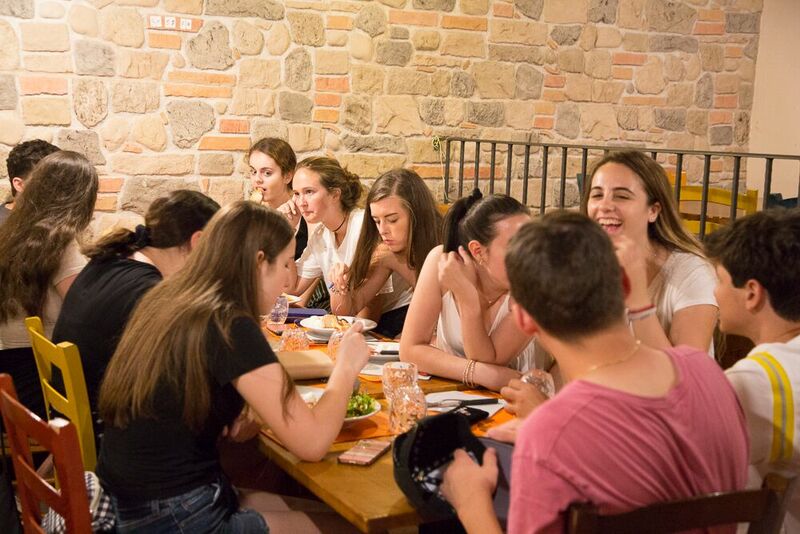 I will capture classroom learning, cultural excursions, day trips, social fun times out and of course the fabulous food and new friends they are enjoying. So check out my Blog. 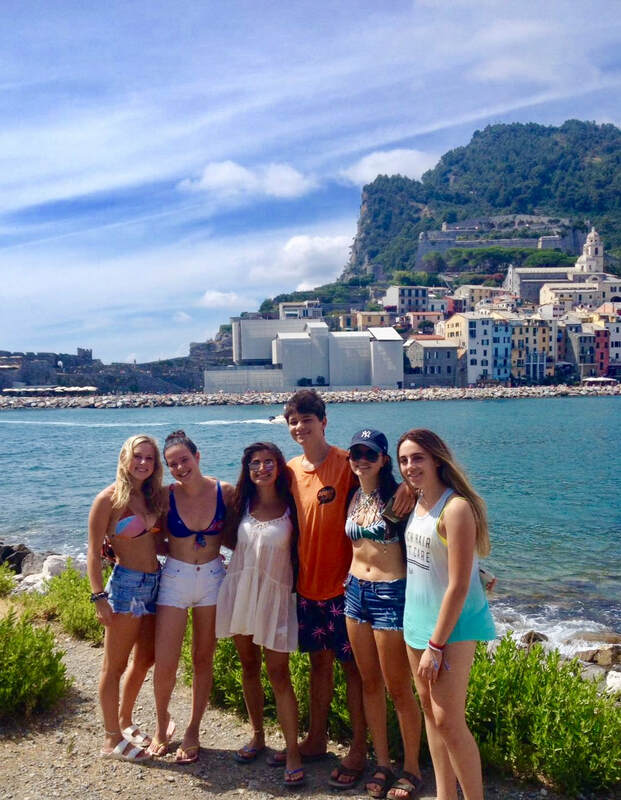 I hope it brings smiles to your faces seeing your kids experiencing Italy. I will be with them every day, and you can always reach out to me by email for any questions. 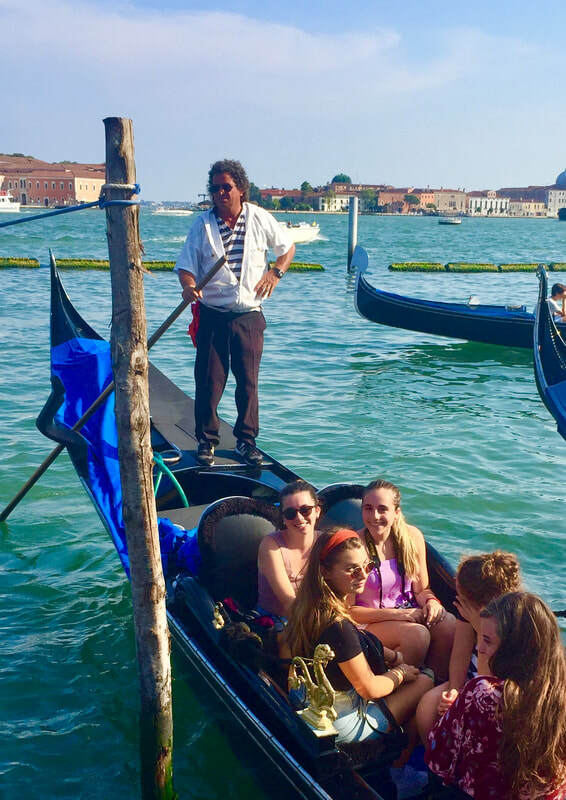 And don't worry if they aren't texting you, it just means they are soaking it in and getting lost in the beauty of Italy. Thank you for sharing your children with us at Abbey Road this summer. 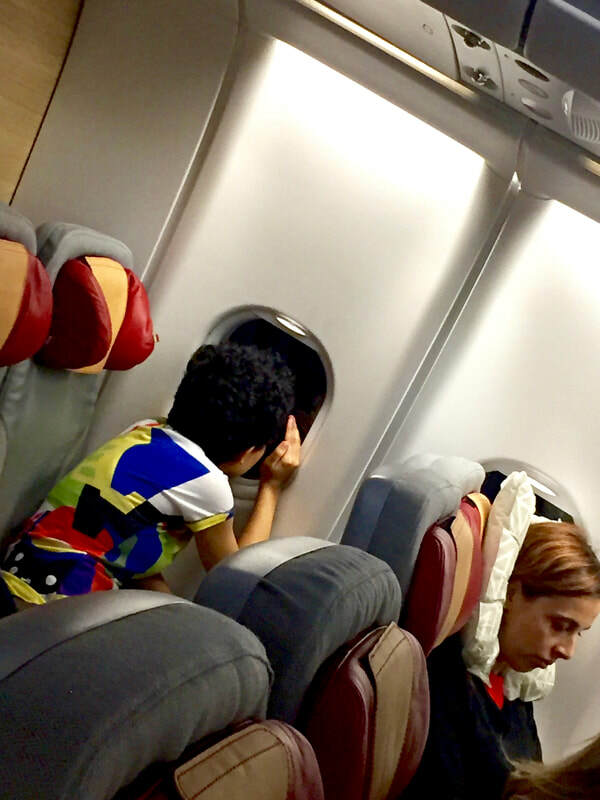 I'll see you at the airport, or in Florence! ANDIAMO! which means 'Let's GO!"